This lot at the corner of St. Ann's Avenue and 142nd Street is now a parking lot rather than a dumping ground. But the church that has controlled it was never able to turn it into anything else. 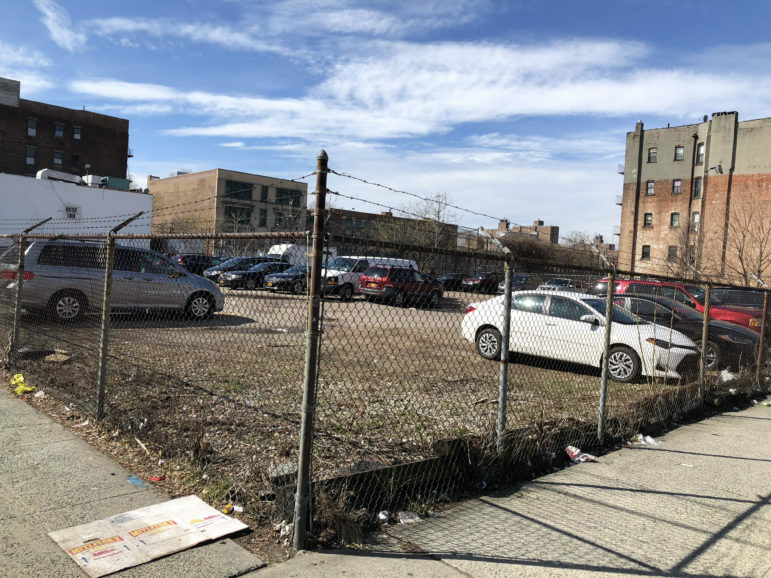 For about two decades, New York City leased a plot of land to the Thessalonica Christian Church in the Bronx, which used the lot mainly as a parking space for its parishioners. Over the years, the church made multiple attempts to develop the land but failed. Recently, a deal between the city and a Massachusetts-based developer to create 169 affordable homes has angered some church allies who say their voices were ignored. The lot, which lies adjacent to the church, is on the corner of St. Ann’s Avenue and 142nd Street in the Mott Haven section of The Bronx. Community and church leaders say that the church, because of its proximity and history with the neighborhood, is better suited to address the needs of the community. An outsider, they say, may not be as committed to the neighborhood as the church. “If we do it, it’s going to be for the community,” says Pastor David Serrano of Thessalonica Christian Church, one of the leading voices against the deal. “We know what the community wants, not them,” he says. In the 1990s, the Thessalonica Christian Church successfully negotiated a month-to-month lease with the city under the city’s Adjacent Home Owners Program (AHOP). Under this program, the city rented or sold city-owned properties —some of which were been used as dumping grounds— adjacent to occupied homes at very low prices. The idea behind AHOP was that transferring ownership of these sites to individuals living next to them would force them to tend the sites— hence preventing blight. But now that the supply of city-owned land suitable for affordable housing development is decreasing, the city has turned its eyes to parcels that were once not a priority. This has caused some friction between communities and the city. Previous attempts to enlarge the church and build a community and residential center on the lot failed when developers backed out of the deal, says Serrano. According to the city’s Department of Housing Preservation (HPD), the move to bring in an outside developer was made only after numerous attempts to work with the church over the years failed. In 2015, HPD issued a Request for Proposals (RFP) for the land, and received 15 submissions —including one from the church. They awarded the contract to a Massachusetts-based firm, The Community Builders (TCB). For some associated with the church, the ill-feeling over its losing out is compounded by the fact that the contract was awarded to an outside developer with little experience in the community. “The fact that they choose someone from Boston who has no idea what The Bronx needs makes no sense,” says Juan Gabriel De Jesus, who acted as the construction liaison between the church and the city. The project, named Park Haven, has earned the endorsement of Bronx Borough President Ruben Diaz Jr. He said in a statement that the inclusion of social services to be provided on site and administered by Bronx Works is what makes the Park Haven project unique. The church says it proposed a similar plan to HPD but was rejected. Its plan included a multi-family residential with about 160 units and a community center complete with social services for youths, seniors and veterans, according to De Jesus. In New York City, proposals for the use of city-owned land are required to undergo through a formal public review called Uniform Land Use Review Procedure (ULURP). While the law requires that affected communities be given a say in how the land is used, it does not give the community the power to stop a development should the city decide to proceed with it. In December 2017, Bronx Community Board 1, which covers the Mott Haven neighborhood, held a public hearing to vote on the ULURP application on the Park Haven project. The board voted 15 to 5 (with one abstention) to disapprove of the project and recommended that TCB work with the church to reach a compromise. There should be development near the Church is essential for the people and board should take action on it quickly because its a religious place ..